Chickens anyone? Break out the books and see what coop design works best for you. Have an existing coop? Strengthen your coop (those raccoons are relentless) and cover even small holes with ¼” hardware cloth to keep mice from finding a way inside. Instead of purchasing a new cordless drill or saw, you might be able to check one out at a tool library in your area. Use recycled wood, as long as it is not painted or treated. And get your compost system honed to handle all the precious materials coming out of the coop when you clean up. Consider bringing bees into your life, as your urban garden can easily support a beehive or two. Order your honey bees this month; there are several local options. Encourage mason bees (great pollinators for fruit trees and early blooming plants) by adding ready-made mason bee houses or leaving snags and wood logs in the garden. You can also purchase them in their cocoons and hatch them out in early spring. 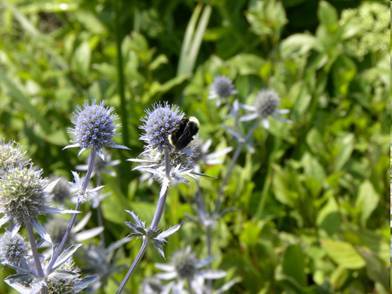 Plant flowering perennials, especially those in the daisy, carrot or mint family, and leave an area “wild and weedy” to support native bumblebees! They need un-trampled places to nest in over the summer and for the queen in the winter. A little up front planning now can enable you to get the best out of your garden this coming summer. For a one on one conversation to help you plan and for information on local resources contact our educators at (206)633-0224 or send us an email.